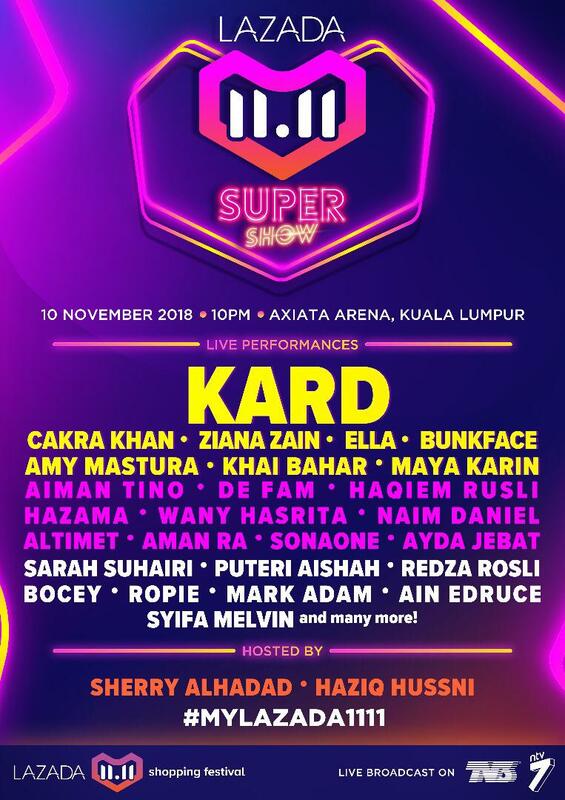 GOKPOP | Exclusive K-News in Malaysia & Singapore: Post a Picture, Hashtag #MYLazada1111 & Meet Kard at Lazada 11.11 Super Show on 10 November! Post a Picture, Hashtag #MYLazada1111 & Meet Kard at Lazada 11.11 Super Show on 10 November! Lazada Malaysia announced the launch of its biggest shopping event of the year, the Lazada 11.11 Shopping Festival. The 24-hour online shopping extravaganza will take off at midnight on 11 November 2018, with a live broadcast countdown show on 10 November 2018. This year’s shopping bonanza promises an exciting shopping experience for bargain hunters and fun seekers, with multi-sensory and multi-screen activities. On the eve of the Lazada 11.11 Shopping Festival, shoppers can tune in to the star-studded one-night-only Lazada 11.11 Super Show. Viewers tuning in can take part in live game sessions to win amazing prizes, and expect variety show-styled skits and performances from renowned local and international celebrities. The evening will culminate in a performance by a K-pop group, KARD. He or she then must reply YES or AGREE to go with you. The contest runs till 31 Oct and the winner will be announced on 1st November. 50 lucky winners will be selected! Take Advantage of the Year’s Craziest Deals and Offers! Don’t wait until 11.11 to add items to your cart! From 1 November 2018, you can start previewing 11.11 prices and adding these items to your cart, so you can check out quickly and conveniently on sale day. Don’t miss out on Collectible Vouchers up to RM 11,000,000, deals as low at RM0.99 and RM200,000 worth of free gifts! There will also be over 10,000 Surprise Boxes up for grabs containing products from various brands up to 70% off. Limited units only! All-nighters can take advantage of the lowest prices of the year from over 50 brands on 11 November from midnight to 2am. Early risers can take advantage of Flash Vouchers beginning 8am for a limited time only. Also look out for Slash It and Shake It sessions throughout the day. Play your way to even more deals with the all new Wonderland feature on the Lazada app! From 1 to 10 November, Lazada app users will have 20 chances to open treasure boxes of top brand and seller vouchers. Taking place each day at 11am and 5pm, tap the Wonderland banner on the Lazada app home page. You will be taken to Wonderland where you will see all participating stores. Tap on a store to unearth the treasure box within. Visit Lazada now to find out more about the Lazada 11.11 Shopping Festival!